We exercise because it’s fun and makes us feel great. We know that the outcome of doing lots of exercise is getting fitter, stronger and healthier, so we don’t feel the need to involve scales or track calories burned. We work hard, we push ourselves in every session and we always come away smiling. When you’re not pressuring yourself to reach some arbitrary goal or complete a randomly chosen number of reps, you’ll end up really enjoying the exercise that you’re doing. If you don’t follow strict exercise plans, which in our experience are boring and almost impossible to stick to, then you can concentrate on having great workouts every time. As your strength and fitness grows, we will push you harder and further to ensure that you keep feeling the results. Not only does being outside allow you to enjoy the beautiful views, fresh air and smells of the countryside, it is also extremely beneficial to mental health and general wellbeing. Luckily, we are based on a beautiful farm in the heart of Oxfordshire where outside space is in abundance. We like to take things back to basics At The Farm so most of our ‘equipment’ is either completely natural or made from materials found on the farm. We get your body working as it’s meant to be worked, moving and pulling and lifting in ways that the human body was made for. Circuits classes involve a range of strength and HIIT training. They are high intensity, full body workouts designed to improve cardiorespiratory fitness and grow strength. All exercises can be adapted to accommodate any level of fitness, making each class appropriate for anyone willing to give it a go. 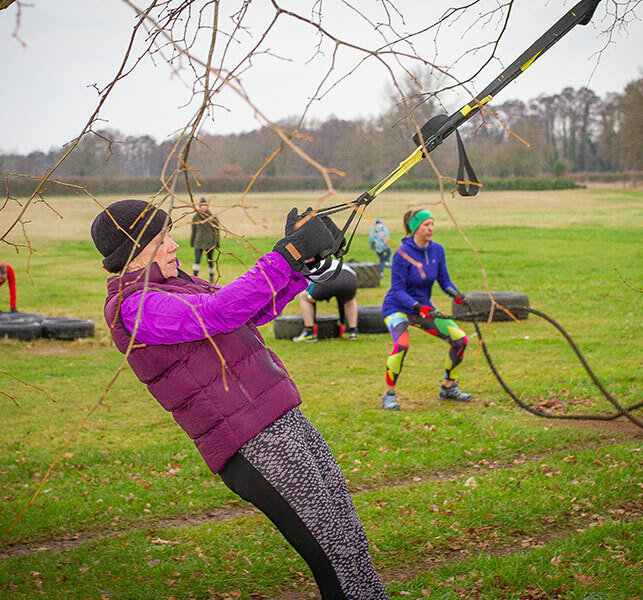 Beginners Bootcamp is designed for those at the beginning of their fitness journey. The class involves a mix of activities to help grow confidence, strength and fitness using the farm as your training ground. We use tyres, logs, rocks and more to give you a workout with a difference. Bootcamp Burn is designed for those who want to be pushed to their limits. An hour of intensive cardiovascular, plyometric and strength exercises that will challenge even the fittest out there. Like what you see? You can book your place online today, with options for a one-off drop in class, bulk bookings or sign up for a full membership that comes with a host of benefits!